Take your career as an interpreter to the next level, with options to work off your tuition, discounts on testing fees and textbooks, or take the CMI certification exam at a discount. As a bilingual speaker, you already have the foundation for a fulfilling career. 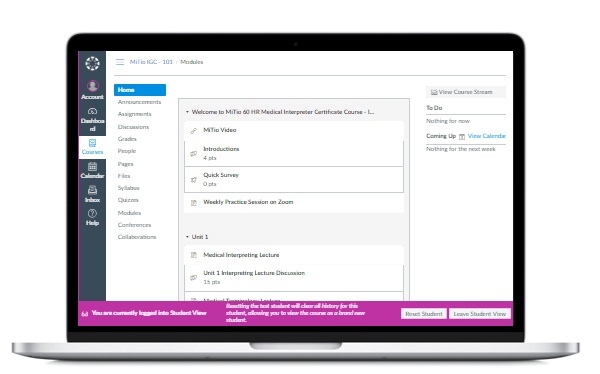 Our 160-hour online course is designed to help you harness your existing language skills and gain the training, accreditation, and professional connections you need to jump-start your career as a certified medical interpreter. Our diploma program offers not only comprehensive training, but also guaranteed employment with MiTio upon completion of the course. With our special “train now, pay later” tuition option, you can start training for just $99 and work as a MiTio interpreter to cover the balance once you’ve earned your certification. Our 40% off tuition option includes cost of all textbooks and language testing fees. Why Earn Your Diploma with MiTio? By offering self-paced online classes, live practice sessions, remote internships, and job placement for all diploma students, we aim to help you excel both in and out of the virtual classroom. No matter what your situation, we’re committed to helping you gain the education and experience you need to be more successful, without making any trade-offs. Access self-paced videos, assignments, and resources from your student portal whenever it suits your schedule. Hone what you’ve learned through straightforward exercises and live practice webinars with MiTio instructors. Build your resume and gain real-world experience before you graduate to stay one step ahead of the competition. Six hours of internship experience. Through this comprehensive training option, you’ll master medical interpreting basics, gain significant real-world experience, and build a more competitive resume. Upon completion, you’ll earn your IMIA-accredited medical interpreter diploma and walk away with the advanced skills and experience needed to be a more competitive job applicant. Diploma recipients are also guaranteed job placement through MiTio’s interpreting agency to provide a seamless transition into your new career path. At Mitio, we don’t want tuition to stand in the way of your career goals. By offering flexible tuition options, we aim to make our course as accessible as possible. This tuition option covers all course costs, including proficiency testing, elective CEU course, 24 hours of live practice sessions, and textbooks. By paying up front before you begin your training, you’ll take advantage of a 40% percent price reduction. Our train now, pay later tuition option allows you to complete the training you need for just a $99 application fee. Once you’ve completed your diploma, you’ll cover the remaining course cost by working 360 interpreting hours for MiTio. This tuition option covers the entire 160-hour course, textbooks, proficiency testing, 24 hours of live practice sessions, elective CEU course, and the costs of taking the national Certification for Medical Interpreters (CMI) exam. This optional, nationally recognized credential helps guarantee compliance across state lines and makes a compelling addition to any resume. "The program is very student friendly. I learned like I never had, because of the way the instructor guided us. I felt very good and comfortable with this learning experience. I am now totally convinced that medical interpreting is the way to go with mycareer. Thank you, Dr. Lee." "The only thing I can honestly say is that this course is amazing. Very well organized, full of information options and websites. I had all of the assistance from the beginning to the end of it. I also really appreciate the incredible help with my internship search." "I really enjoyed taking this course. It was well organized and insightful. Thank you for all of your efforts to train and educate Interpreters and Translators." " really enjoyed this course. It is the first time I had such useful power points presentations on the different body systems. The presentations were excellent it really helps to memorize words, understand different issues. All the materials presented were really fantastic. Also the teacher was very helpful with her remarks and websites and different aids she offered us." At MiTio, we’re committed to helping you learn the skills you need to excel without sacrificing the other things that matter in your life. You can do it all—we’re just here to help you find the right balance. What are you waiting for? Enroll today and invest in your future.